There's still plenty to be had in the garden at the moment and I was quite please with this little collection for our roast on Sunday. 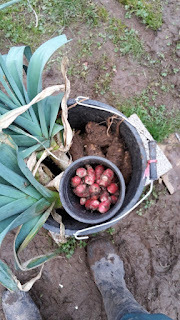 Managed to have leeks (although there isn't many left now - another couple of meals), jersualm artichokes, New Zealand Yams ( I love these more and more each time I eat them) and the last of the parsnips. Few things more satisfying than going out and digging up the food for tea! we've got leeks and parsnips ready to eat after that the veg patch is barren waiting for this years plantings. at the moment I'm mostly harvesting home brew Cider and ginger beer! Kale and Parsley. But plenty of bottles, and frozen veg. We also still have Butternuts in store. Sprouts, nero kale and sprouted seeds. I have parsley, basil and oregano in the kitchen. Rosemary and thyme outside. Nothing else at all. Weather is terrible I cant wait to get out there and sort all the veg out. Looks lovely, Kev. I'm still getting some winter salad.